Great for weddings, interviews, social settings, modeling, substituting for temporary crown, hiding implant surgery and more! 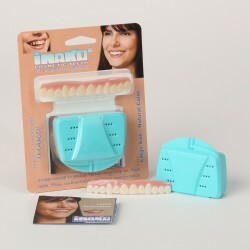 Imako Cosmetic Teeth® are the perfect accessory to your smile! 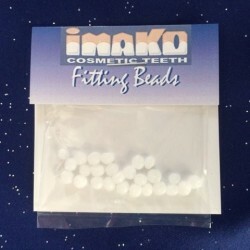 The front of the Imako Cosmetic Teeth® look like a set of perfect teeth and gums. Each set is fitted to your individual mouth and needs. Check out our fitting video with instructions on how to get started. You can see the light shining through. Embarrassed to smile? 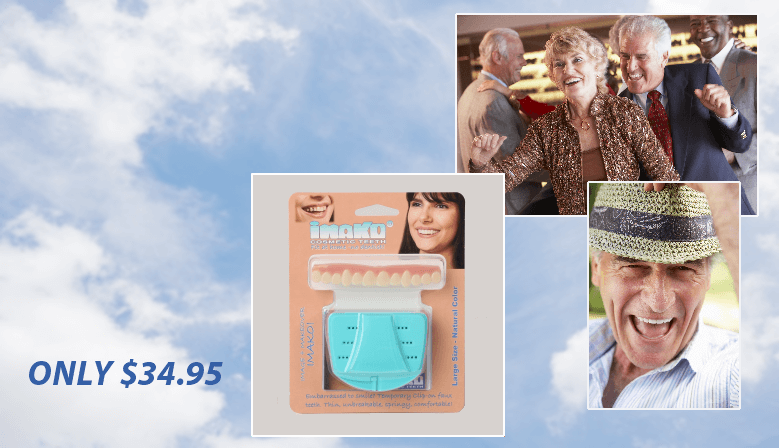 For just $34.95, Imako® Cosmetic Teeth restore your confidence! Do it Yourself - No dental visit. The fake teeth shell arrives flat, but once fitted, it's arch-shaped, springy and clips over your upper teeth gently but securely. If you don't get it right, you can try again! Comfortable, Believable - Unlike other brands, it's so thin so your face isn't distorted. Speak perfectly - even your bite isn't affected. Flexible, light as a feather and long enough to cover your entire smile. Wear them all day long! 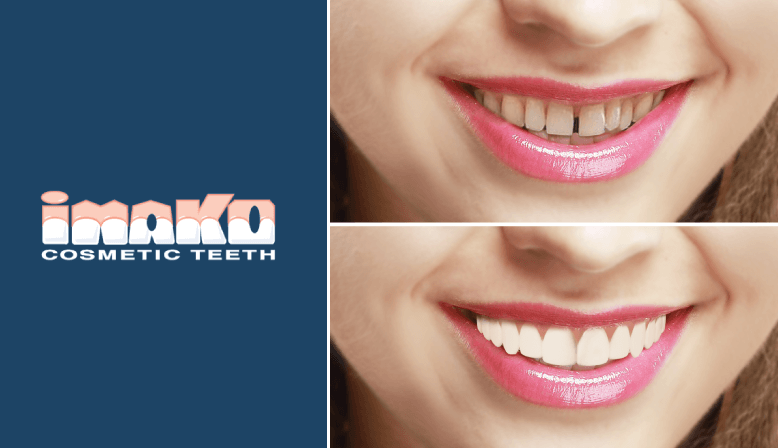 Save on Dentistry - Don't pay for expensive temporary crowns or flippers during your treatment, wear Imako® Cosmetic Teeth and save hundreds. You can adjust the fit to accommodate the progress of your treatment. such an immediate and profound cosmetic improvement! 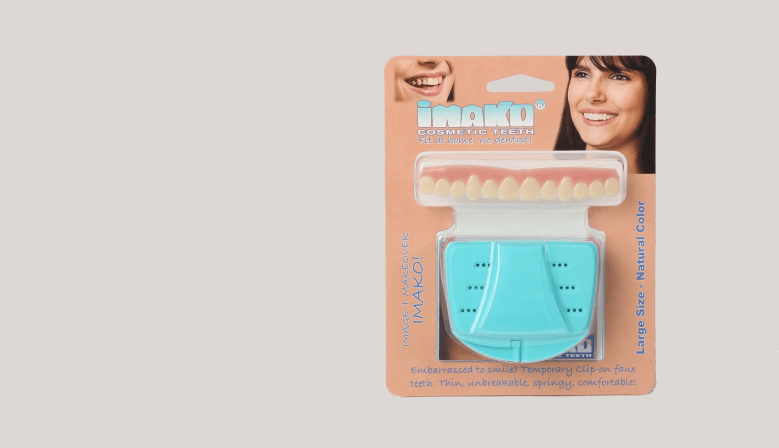 Hear what others are saying about Imako Cosmetic Teeth ... fake teeth they love to clip-on. Your product has truly changed my life. I can't express how much confidence you've given me. I was able to get a new better job thanks to your product helping me feel amazing during my interview. Happy Holidays to you and yours. I'm a customer for life! I am thrilled to smile again. I'm unable to afford dental work right now and my teeth have begun to break. I am a person who loves to laugh and smile. I have been so depressed about my teeth. I am beyond happy ! 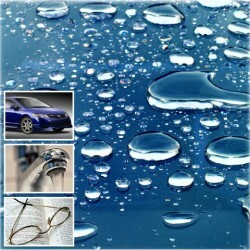 Made in the USA of FDA approved and safe materials. Surprisingly adaptable to most dental problems, but some teeth are needed for support. 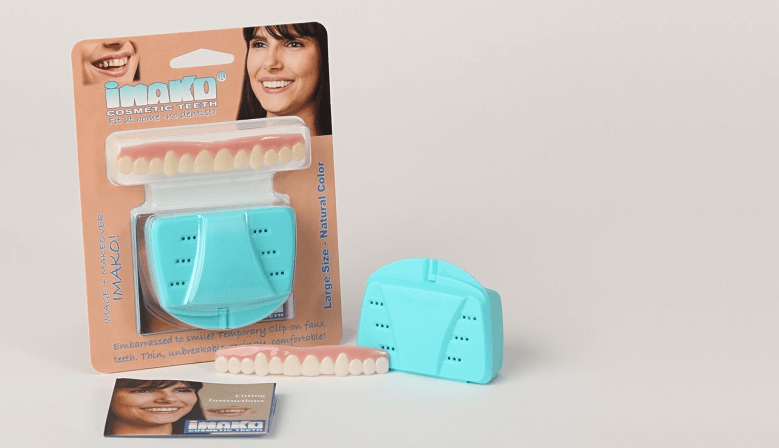 Fitting Imako® Cosmetic Teeth is thoroughly explained in our online video and printed instructions. During business hours, we are happy to assist you. 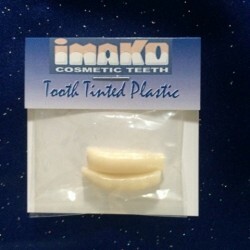 Imako® Cosmetic Teeth is not therapeutic or recommended for eating. Imako can be worn over natural teeth, dentures, bondings, veneers, crowns and temporary crowns, but not braces. You are instructed to imprint the shapes of your teeth on the inner surface, no sticky adhesives needed. Imako® can be inserted and removed easily and discreetly. Discreet packaging. 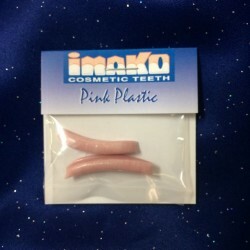 THREE PACKS: Our Imako cosmetic teeth are also available in bulk three packs! Available in packs of: 3 large bleached, 3 small bleached, 3 large natural and 3 small natural. Embarrassed to smile? Affordable cosmetic teeth just $34.95. Made in the USA and FREE SHIPPING in the USA too! 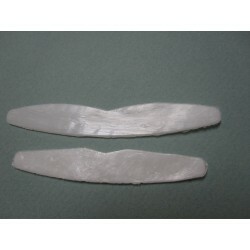 Imako is the original cosmetic teeth makeover available in Large and Small sizes, natural and bleached. 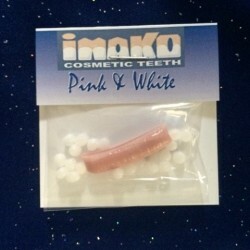 You're going to love Imako Cosmetic Teeth. 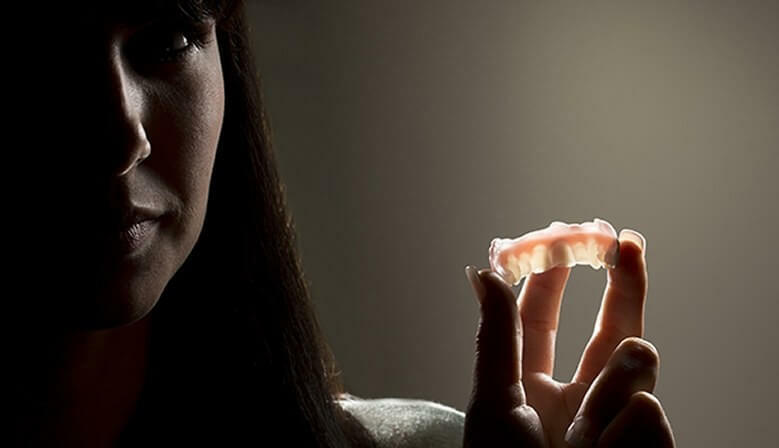 A space age silicon polymer which protects teeth and prosthetics naturally. Protect against dry mouth, chemo damage & candida. Easy to apply. Revolutionary clear polymer sealant which coats by simply rubbing on, and stays permanently unless the substrate is removed. Use to reduce friction, stop oxidation, antimicrobial, neutralize static electricity, seal granite countertops and millions of other uses. For a lot of tooth loss: stiffen places where teeth are missing. Optional, enough for 3-4 missing teeth already in the kit. THIS layer is already bonded to our product, so you do not need or want to use this product unless you want to REPLACE the layer already on the back of the cosmetic teeth. 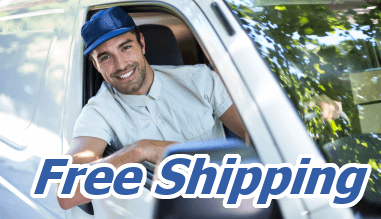 To learn more about our delivery and shipping policies, CLICK HERE. We are here to help. For assistance please contact us at 866-513-7308, or use our Contact Us page. We securely accept all major credit cards, check and Paypal. For more informaiton on security and privacy policies, CLICK HERE.